“We are really sorry for all that went wrong during your trip,” an email from the guide company said. The nostalgia made me weak: just a few weeks prior, on the third day of our climb, we stared at burned remnants of our camp, mysteriously destroyed by arson. Limited known motive pointed toward terrorism or commercial envy. But the most potent sign for me was that this was the end of a longtime goal. My friends and I were in Uganda, to attempt a climb-and-ski descent of Africa’s third highest peak, on the mountainous border separating the Democratic Republic of the Congo from Uganda where we currently stood. Margherita Peak (5109m), the highest of the Mount Stanley massif, is home to what many consider Africa’s last glacier. Mount Kilimanjaro’s perennial ice is virtually gone, relegated to the confines of giant ice blocks. Mount Kenya’s glaciers are so emaciated that their only snow cover is seasonal. Aside from some old European magazine articles, I’ve found no record of contemporary attempts to ski on the Margherita Glacier, and no attempts from the top of it. More importantly, I could find no compelling reason not to try. Climbing and skiing in unexpected places is not just a personal pursuit—it’s also my job. As a professional adventure skier, I work with outdoor brands to share stories of climbing and skiing all over the world. This career has taken me to dozens of countries and mountain ranges, from Alaska to Kazakhstan, Patagonia to the Arctic. But Uganda was the first time I’d take lightweight alpine touring skis, winter camping equipment, and specialty tools prepared to help us carry ten days’ of supplies from the Ugandan rainforest to its alpine altitudes. Private fixed camps dot the approach to Margherita Peak, outfitted with canvas tents erected beside occasional wooden huts. Given their existence, we nor our 15 hired Ugandan porters carried tents. In lieu of carrying our own, we’d sleep in the permanent camps that 450 local workers started building in 2008 under the direction of Australian expat and entrepreneur John Hunwick . Without these camps and the trail connecting them, we wouldn’t be able to reach the peak. Our first day ended at a basic wooden cabin perched on a narrow rainforest ridge, just under the shade of the lush canopy. Our skis sat on the porch as white-faced monkeys swung from nearby branches. After eight hours of hiking the following day, our second camp was more rustic, but comfortable for skiers accustomed to tents. Cresting a hill into a valley on our third long day of hiking, a porter came running down the trail. He wasn’t out of breath—the porters never were. He hurriedly spoke to our Ugandan guide in their shared tribal language. Although English is the national language of Uganda, over 40 indigenous languages allow inter- but not intra-tribal communication. They chatted despairingly. Our guide Enock turned to us. Wordlessly, he pointed out the green dot of a hut above a rocky cliff across the valley. “We have a bit of a problem, that our camp has been burned,” he said to the three of us, nearly emotionless. Noticing that we didn’t understand him, he repeated his statement. My friend Mary saw me staring inquisitively, having not understood the word “burned” through his accent, and clarified for me in her reply. Enock’s head dropped and he began walking, motioning for us to follow him. We went silently, each of us in our own sphere of curiosity. Coming around the cliff’s edge 45 minutes later, the ashen tents were revealed. They weren’t just charred, as they appeared from across the valley. They’d been burned to the ground. The following hour was a blur of satellite phone calls and four confused gringos listening to conversations we couldn’t understand. It was clear that the facts surrounding the arson were as murky as our next move. Enock gathered us to explain the situation. We were less than 10 miles from Uganda’s border with the Democratic Republic of Congo, and the Ugandans feared that perhaps Congolese rebels had, seemingly without cause, skirted the mountain to destroy camps that allowed climbers to ascend a peak straddling the countries’ border but claimed by Uganda. (A few days later on the summit, our guide told us that as soon as a climber steps west of the summit, she crosses into the DRC. Most available maps disagree, showing the summit clearly in the DRC). Another potential suspect was the other guide service operating in the Rwenzori Mountains. Though its groups typically climbed a different aspect of the peak and approached via a separate trail system, this company had recently seen a decline in business. The company for which Enock worked was seeing an uptick. Potentially, our guides told us, the camps were burned out of jealousy. I went from not caring why they were burned and just wanting to continue upward regardless of evening accommodations, to being concerned for the safety of our team. Whoever burned these camps—Ugandan or Congolese—didn’t want us on the mountain. Who knows what they would do if they found us. We had to make quick decisions. The sun was going down, we were hours from our previous camp, and we didn’t know if the next camp would be standing or not. When our guides decided that our best option was to descend, my team was prepared with a counterargument: We would sleep on the muddy ground in a burned hut, without losing elevation. Used to high-brow clients, the guides were surprised. Not until then did they realize how badly we wanted to climb the mountain, nor that we were very accustomed to sleeping on the ground. While the Ugandans might have been ashamed for us to sleep with the porters and guides, Mary, Robin, Kasha, and I had our favorite night of the trip — sharing an intimate space with the local people. The next day, we used a Garmin inReach to dispatch more porters from the village, bringing tents and additional supplies. Still other porters ran up to the next intermediate camp, and found it burned as well. We were joined by four armed Uganda Wildlife Authority national park rangers. They were there for our safety, should we run into whomever didn’t want us on the mountain. Our crew swelled to over 25 people, raising concerns about our ability to feed and accommodate everyone. To make up for time lost at camp three, the following day was double-length, passing another burned camp en route to our highest camp. Surprisingly, it was intact. After four days of hiking, we climbed to the summit and skied the full 1,100 vertical feet of one of Africa’s last, although emaciated and shrinking, remaining glaciers. People often ask me about the quality of the skiing on high peaks around the world, especially on lightweight carbon skis. The truth is, the snow quality is usually awful, as we can’t time international expeditions around a single powder day. But bad snow doesn’t make the skiing, much less the experience, inherently bad. Jump turns overlooking a u-shaped valley formed by millions of years of glacial movement stretching into the horizon, in Africa, is obviously what made this experience so special. I certainly didn’t visit Uganda for the powder, nor for the accommodations, and certainly not for the threat of terrorism. I visited for the experience of doing what I know best—climbing and skiing mountains—in a setting entirely foreign to me. Because presenting myself with that combination of the familiar with the unfamiliar is what I seek in my travels and in my life. Terrorism and domestic disputes aren’t the only causes of havoc on Ugandan tourism. Climate change has virtually eliminated the ice and snow that once attracted climbers from around the world. The gaunt glacier is barely providing enough freshwater to downstream community farms. Because the lush rainforest covers the trail, the less it is used the more overgrown it becomes. Guides are seeing less work and are fearful of losing their jobs. The effects of climate change are very economic in west-central Uganda. On our way back to the village, we took a break atop Bamwanjara Pass (4450m), and I thanked our lead UWA ranger for hiking with us. I just hadn’t realized that the end was such a real threat. 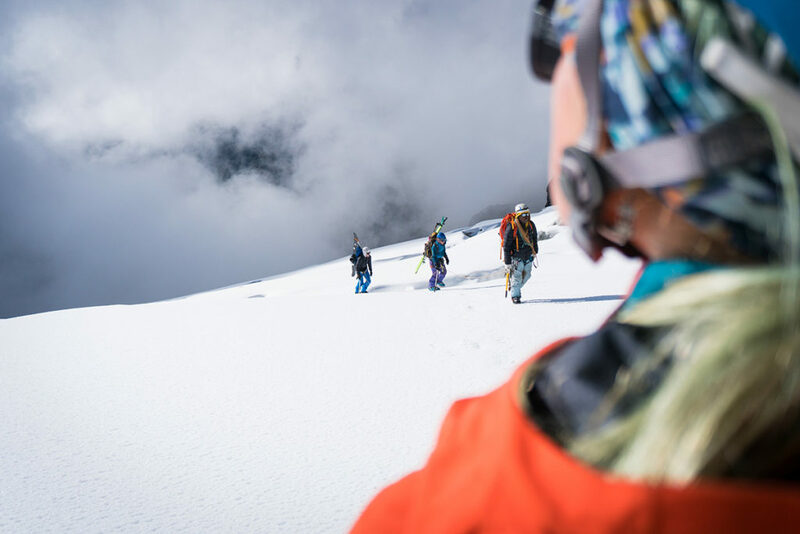 –Brody Leven is a professional adventure skier who ironically prefers climbing up mountains to skiing down them. He travels the world on a shoestring, returning with elevated stories of his year-round mountain adventures to inspire others to tackle difficult challenges. Brody’s activism focuses on environmental stewardship, public lands advocacy, and avalanche education. Nice article! I often wondered about this trip of yours, when you mentioned that a camp had been burned. Thanks for the details; it is interesting to learn of these things. As always, take care in your future travels! !